Successfully Added Smart Home Safety + Security Kit - IP Camera, Gas Detector, Smoke Alarm, PIR Sensors, Door Sensors, iOS + Android App to your Shopping Cart. 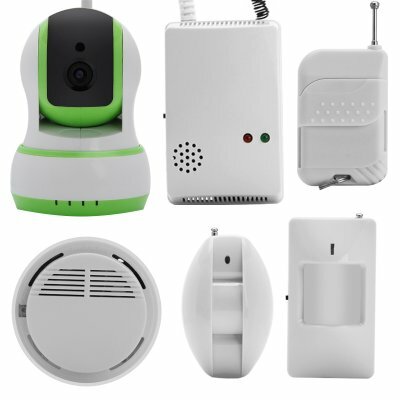 Real time video monitoring with and two way audio system to check in with your family or pets. Two precision motion detection sensors will ensure no one creeps in undetected and a 1/4 inch CMOS camera with pan and tilt functions let you scan the house for any intruders or just check in on Fido while you're out at work. The camera has two way audio support so you can even tell Fido to get off the sofa and to stop chewing your slippers. With HD video and alerts sent directly to your Android or iOS phone this smart home security systems makes it easy to track what's happening when you're not around. Protect what matters from sources of harm with the gas and smoke detectors, these lifesaving sensors not only protect the most important place in your life but also your loved ones from deadly household threats. The gas leak detector will notify you of harmful levels of gas so leaks won't go undetected and if a fire starts in your home the smoke detector brings you a fast alert, triggering the alarm and buying you and loved ones the valuable time to get out safe. Placing contact sensors on doors or windows will ensure they can't be opened without triggering the alarm, this will let you secure the entrances to your home and make a secure barrier alerting you to any intruders.